Inspired by the amazing ink job on his good friend The Baroness, tattoo master Joe Capobianco’s contemporary take on the iconic Bride comes to vinyl as an 8-inch masterpiece. Limited to 400 worldwide and retailing for $100 US (£90 UK; 100€ Europe), the buxom Bride arrives at all Kidrobot stores, kidrobot.com, and select retailers on May 20. 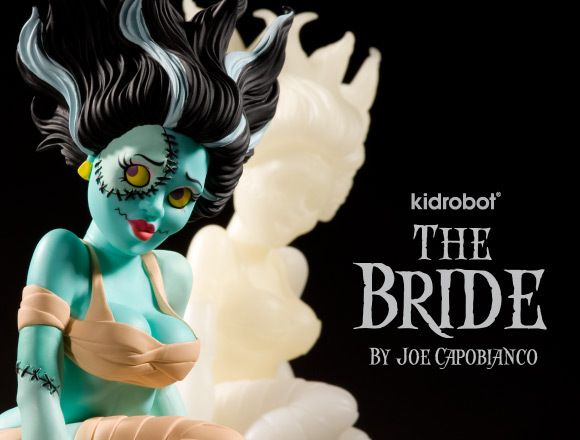 Inspired by the amazing ink job on his good friend The Baroness, tattoo master Joe Capobianco’s contemporary take on the iconic Bride comes to vinyl as an 8-inch GID masterpiece. Limited to only 50 worldwide and retailing for $100 US (£90 UK; 100€ Europe), the glowing buxom Bride arrives at all Kidrobot stores and kidrobot.com on May 20. 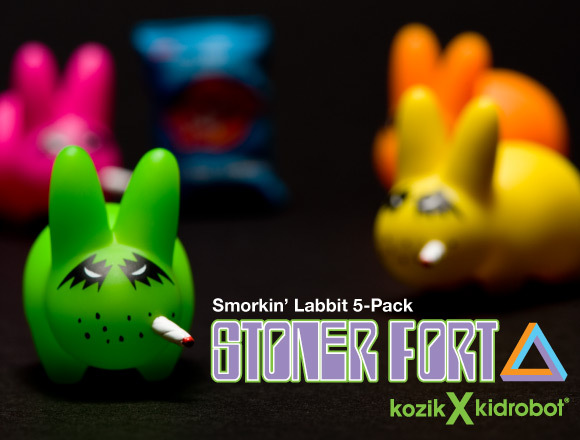 San Francisco artist Frank Kozik’s latest 5-pack gets blunt with four 1-inch homegrown Labbits and a bag of munchies accessory. Retailing for $24.95 US (£22.50 UK; 25€ Europe), these puff daddies get lifted at all Kidrobot stores, kidrobot.com, and select retailers on May 20.